On my last day of that particular trip to Marsa Shagra, I went snorkelling at 6am. I swam for about 90 minutes and managed some great shots. This one was towards the end of my swim, close to the jetty. 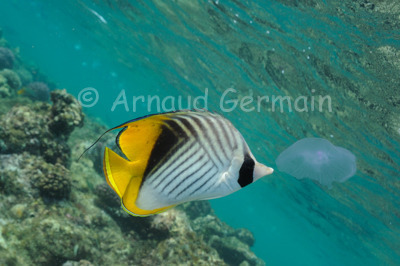 This treadfin butterflyfish was enjoying his breakfast of jellyfish. I went underwater to get a better angle and as I was not making any bubbles, I managed to get close to the action without scaring the fish. Marsa Shagra South House Reef at about 2 metres, Marsa Alam, Egypt.